This was GOING to be the last day, so we were prepared to get the most out of it. And there were panels we all wanted to see on our own, so we did. Troy headed off to see Heroes panel, Chris went off to see Futurama and Simpsons and I…well… I wanted to shop and browse and zig zag through the exhibit hall untethered. 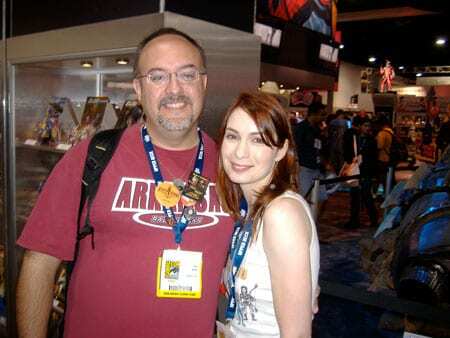 I bought some shirts, took photos of people in costume, got some freebies and ran SMACK DAB into Felicia Day who wrote The Guild, an online webisode series that was hilarious! I’m sure I looked like a weird fan hovering, but she was on the phone and I was waiting until she was done. After she got off the phone, I spoke briefly to her and snapped a photo. I was going to try to catch up with her and her cast again, but the line was long at her booth and I had some panel sessions to attend. I also snapped a picture of Jamie Bamber (from Battlestar) who was at a booth for autographs and promoting a new movie. Now, this WAS the room we were unable to get into the day before. As I said, I learned my lesson. PLUS it was easier for one person to find a seat than four finding seats together. Luck would have it that Chris was already IN the room so I ended up joining him after Koontz. The Battlestar Panel was great. Lots of inside-behind the scenes stuff. Not so much spoilers or giving anything away, but thoughts about their experiences during the show. Plus, Kevin Smith asking the questions was VERY entertaining. The cast that appeared were the director and producer, Ronald Moore and David Eick, as well as James Callis (Balter), Tricia Helfer (Six), Katee Sackhoff (Starbuck), Michael Trucco (Anders/Cylon), and two others who weren’t scheduled, but were there: Jamie Bamber (Apollo) and Tahmoh Penikett (Helo). They recived a very very long standing ovation, took pictures of the audience and graciously stood to recieve the applause. I was really glad to see them in person as this has probably been one of my favorite shows. Afterwards, me and Chris headed back to the exhibit hall to wander seperately and waited on Troy to get out of his session, Kim, her husband and daughter to show. We headed for food before the big Masquerade Ball and ended up at a nifty restaurant that was a mexican/western/coastal fusion thingie. It was hella good! Kim and Tom’s little girl is C.U.T.E.! Only Troy, Kim and I headed to the con. The place was packed, but spread out with screens in all the major rooms, since the ballroom was full. 46 entries, and they all did little shows. Unfortunately, we didn’t get back until contestant #34. Only a couple were really good. We didn’t stick around to see who won. However, they WERE serving up some snacks, and a cash bar. A D.J. busted out some music and soon the Joker and Catwoman were cuttin’ a rug and robbin’ the attendees. HAD I KNOWN there would be dancing and late night activities…. As it was, I was SLEEPY and thinkin’ we had to get up early to get Chris to the airport. Obviously I’ve been wiped out at night since I haven’t been updating regularly. Here are some pics…and I made sure to take some for my women friends!